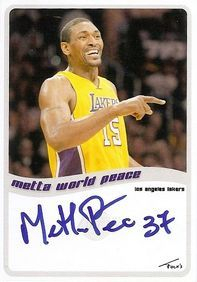 2 July 2015 - Incredible mail came in today as I received two regular cards and a custom card back from Metta World Peace! I had sent them about three months ago and never heard anything since. About a months ago he told me via Twitter that he hadn't received them so I had given up on the cards. Then today to my great surprise I got an envelope with Italian stamps on it and along with it came these three incredible cards! What a great addition to my collection and from one of my favorite athletes nonetheless! 10 June 2015 - Yesterday Real Madrid visited Valencia. Yes, we made it to the Semifinals after beating Bilbao in Game 3 of the Quarter Finals and after that we lost and won a game in Madrid in semis. Game 3 and 4 are played here so we had a good chance of wrapping up the series at home. In yesterday's game we were ahead most of the second half but ended up tied 100-100 with final possession. Luke Harangody hit an amazing three pointer which would have given us the win but after revision shot clock violation was called. In overtime we were tied again with a few seconds left but Sergio Llull hit a last-second three pointer that gave them the win. After the game Luka Doncic, Rudy Fernandez, Gustavo Ayon, Salah Mejri, Sergio Llull, Marcus Slaughter and coach Pablo Laso signed custom cards and I also got autos on regular cards from Rudy Fernandez, Sergio Rodriguez, Andrés Nocioni, Zan Tabak, Sergio Llull and Felipe Reyes. Tomorrow Game 4 to tie the series - or go home. 30 May 2015 - Today Bilbao Basket visited Valencia in Game 2 of the Quarter Finals. We had won the first game in Bilbao and this was our opportunity to advance to semis. Unfortunately our below-par game and poor officiating made it difficult for us and we took a loss at home. The decisive Game 3 on Monday in Bilbao. After the game Luke Harangody signed the sticker for a new custom card series I am preparing and Marko Todorovic signed his bio in the game program. What was funny was that before signing he first took a minute to read it before giving it a nod of approval. Let's hope for a positive outcome on Monday so we can advance to the next round, where Barcelona is already waiting. 17 May 2015 - A good friend of mine went to Israel a few weeks ago and attended the Euroleague game between Maccabi Tel Aviv and Fenerbahce. She was kind enough to bring eleven (!!) custom cards of mine with her to get signed and today I got them back. From Maccabi I got Alex Tyus, Joseph Forte, Jeremy Pargo, Joe Alexander and Marquez Haynes and from Fenerbahce I got Andrew Goudelock, Jan Vesely, Bogdan Bogdanovic, Semih Erden, Euroleague MVP Nemanja Bjelica and legendary coach Zeljko Obradovic. She also gave me her card of Sofoklis Schortsanitis. Incredible!! 16 May 2015 - Valencia Basket received Bilbao Basket in a game that would decide fourth seed in the league and therefore homecourt advantage in playoffs. It was a weird game in which we were 10 points ahead first but later trailed by up to 15. We managed to get close but messed up in the final seconds and took a painful loss. After the game Alex Mumbrú signed a regular card and Raül López, Marko Todorovic and Latavious Williams signed custom cards. Former Valencia player Kosta Perovic, who visited the game, signed a blank card for me - I may put a sticker design on top or do a cut auto of him. 25 April 2015 – Tonight we received La Bruixa d’Or from Manresa, one of the lower-ranked teams in the league. We were ahead throughout the game but towards the end of the game they bridged the gap and with two seconds left they had a threepoint shot to tie the game which fortunately they missed. After the game I received autographs on custom cards from Isaac Fotu and DJ Seeley and veteran coach Pedro Martinez signed a regular card. 12 April 2015 - Yesterday Gipuzkoa Basket visited Valencia Basket. It was a solid victory (109-86) with a franchise record 17 threepointers on 71% shooting. After the game Jared Jordan signed the 100th card of this year's Folk's Cards set and Nemanja Nedovic also signed a custom card. As a follow-up on my three-card 'Gold Standard' set I did two years ago I made a similar mini-set of three called 'Gold Rush'. Luke Harangody, Rafa Martínez and Sam Van Rossom signed their cards. Unfortunately the scans (nor the photos) don't do justice to the actual appearance of the cards - IRL they look pretty cool! 22 March 2015 - Today FC Barcelona visited Valencia Basket in the national league. It was the 'homecoming' of Justin Doellman who played very successfully with Valencia during the last two seasons and he was indeed welcomed with a standing ovation. That was however also the end of all friendliness as the crowd was in for a win against Barcelona and the arena was roaring from the beginning. Although it was a tight game throughout the first half, mostly in our favor, we managed to extend our lead gradually after the break and ended up with an incredible 93-73 win. After the game I picked up autographs on custom cards from Juan Carlos Navarro, Mario Hezonja, Tomas Satoransky, Tibor Pleiss, Marcelinho Huertas, Maciej Lampe and Edwin Jackson. Bostjan Nachbar signed a custom jersey card and I also had a quick chat with Justin Doellman who signed a custom card for the Valencia Basket set. Finally I also had an opportunity to thank DeShaun Thomas for the custom cards he signed and sent through the mail a little while ago. He remembered and was visibly very happy that I got them, a great guy to meet. I also received a bunch of other cards friends of mine had signed earlier this week when Russian powerhouse BC Khimki visited Valencia for Eurocup. Unfortunately I couldn't attend the game, which was a bummer because among their players was newly signed Victor Claver, a local and long-time Valencia player. They brought me back signed custom cards of Tyler Honeycutt, Tyrese Ryce, Paul Davis, James Augustine and Sergei Monia. 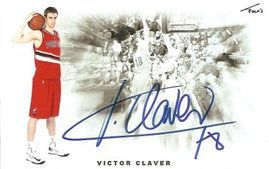 Victor Claver signed one too, as well as a custom card for the Valencia Basket set. An amazing gesture from my friends to help me out, once again! 14 March 2015 - Former Indiana Pacers guard Ben Hansbrough signed with Laboral Kutxa in Vitoria, Spain a couple of weeks As the team had already visited Valencia earlier this season I decided to send him a custom card by mail for signature. It came back yesterday. 08 March 2015 - CAI Zaragoza visited Valencia today, a particularly fun game for me as I got to catch up with their Dutch centre Henk Norel. It was a tight game throughout and it came down to the last minute to decide the game. Zaragoza was three points ahead and with free throws back and forth it was a nailbiting final. We had a last-second three point opportunity to tie the game but unfortunately that bounced out. After the game a had a quick moment to chat with Norel and I picked up autographs on custom cards from former Valencia guard Jason Robinson and also Marcus Landry and Chris Goulding. 05 March 2015 - Yesterday Bayern Munich visited Valencia Basket in the eighth-finals of the Eurocup. This was the home game of a two-way round so it was important to try and get a win in order to have some advantage in the return game. Surprisingly we had control over the game throughout and ended up winning the game by 22 points. A comfortable margin to take to Germany for the return. After the game Bryce Taylor and former Valencia coach (now Munich) Svetislav Pesic signed regular cards. 16 February 2015 - Real Madrid visited Valencia Basket yesterday. Our team played pretty well and the game went evenly until halftime, but Madrid came out strong in third quarter. We managed to close the distance a little bit but ended up losing the game 87-99. 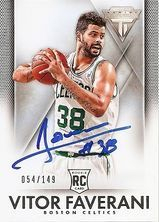 After the game Andrés Nocioni signed a custom jersey card and Sergio Rodriguez, KC Rivers, Felipe Reyes, Facundo Campazzo and Jaycee Carroll signed custom cards. I was also happy to meet Zan Tabak, a Croatian center who was part of the 1995 Toronto Raptors expansion draft and is now assistant coach with Madrid. He kindly signed a regular and custom card. 12 February 2015 - Yesterday Valencia Basket received Russian powerhouse Lokomotiv Kuban in Eurocup. Although the Last32 was already decided and there was nothing at stake it was a good test case for both teams and it was a close and enjoyable game that was decided only in the last seconds in favor of the Russian team. After the game I received autographs on my custom cards from Anthony Randolph, Malcolm Delaney, Derrick Brown and Richard Hendrix. What I was also very excited about was meeting Sergei Bazarevich. I started collecting basketball cards in 1994 and my first set was Collector's Choice. I vividly remember one of the odd-ones-out from that year was this 29-year-old Russian rookie with a big moustache who had actually already gone through an entire career in Europe. I was very pleased to meet him and he very kindly signed that very rookie card and a custom card. 5 February 2015 - A week and a half ago when I was in the mall I walked into Boston Celtics center Vitor Faverani. For some months now he has been in Murcia, a town some 200 miles south of Valencia, to recover from his knee surgery and he occasionally comes over as he's got loads of friends here from his time at Valencia Basket. We chatted for a bit and I asked if I could send some more cards for signature. He was fine with that and a few days later I sent them over. Today I got them back - they all look awesome! 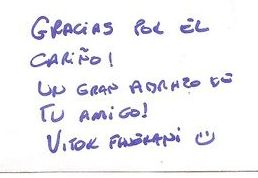 What's more, he even wrote a little message on the back of the envelope: "Thanks for the love, a big hug from your friend Vitor Faverani". 28 January 2015 - An awesome mailday today as I got two cards back that I sent to Muggsy Bogues over half a year ago. I sent a custom card (from the previous series) and his official rookie card but never heard back. I thought it had gone lost in mail or that my mail was disregarded, but fortunately today they came back! I love them!! 25 January 2015 - Yesterday UCAM Murcia visited Valencia Basket. It was our first game without Coach Perasovic who was dismissed the day after this week's loss against Ploiesti in Eurocup. It was a tight game until halftime, but we managed to get a much needed comfortable win in the second half. After the game I got autographs on custom cards from Thomas Kelati, Raulzinho Neto, Scott Wood and Johnny Rogers. 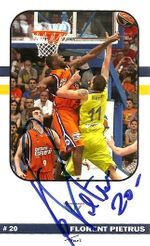 Thomas Kelati also signed a card for my Valencia Basket set and Augusto Lima signed the game program. 21 January 2015 - Valencia received Asesoft Ploiesti from Romania today in the Eurocup. It was expected to be a fairly easy game, especially when this morning it was announced that their star PG Dee Brown had left the team. Nevertheless they came out strong and got away with a narrow win. I couldn't attend the game, but earlier in the day I managed to catch the players near the arena and Alhaji Mohammed and Jarvis Hayes signed custom cards. I am particularly happy with the Mohammed card, it shows him in Kuwaiti uniform, in a similar action shot as this dunk. 17 January 2015 - Friends of mine had the opportunity of going to London (UK) to see the Knicks-Bucks game on 15 January. They kindly let me give them cards to try get signed there, although I thought chances were extremely slim they would be successful. Little did I know. 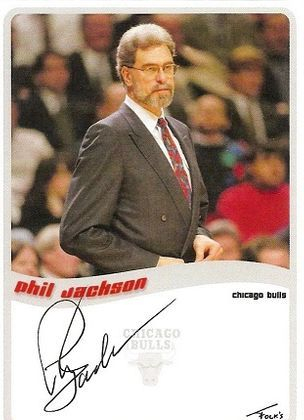 Not only did they manage to get Giannis 'the Greek Freak' Antetokounmpo and Jose Manuel Calderon to sign my custom cards, they even got Phil Jackson!!!!! He's a coach whom I have always admired a lot so this is definitely the greatest and most meaningful addition to my collection! I still can't believe it! 17 January 2015 - Tonight Valencia Basket received Fuenlabrada at home. A victory was necessary to qualify for the forthcoming 'King's Cup' and as the visiting team is low-ranked, it turned out to be a fairly easy ride. After the game Jeleel 'Deji' Akindele and Moussa Diagné signed custom cards and Dan Clark signed a regular card. 06 January 2015 - Valencia Basket descended from Euroleague to Eurocup a few weeks ago and today we had our first game against French team SLUC Nancy. It is the current team of Valencia's long-time player Florent Piétrus and it was exciting to see him come 'home'. During the player presentation he got a 2 minute long standing ovation from the crowd. It turned out to be a really easy win (77-46). After the game Florent Pietrus and Coach Velimir Perasovic signed cards for the Valencia Basket set, Bandja Sy and Ryan Reid signed custom cards and I also received an autograph from Sergii Gladyr on a regular card. 03 January 2015 - Today we won against visiting Iberostar Tenerife, which was an important win to qualify for the upcoming King's Cup. I couldn't attend the game but afterwards I managed to pick up autographs for the Valencia Basket custom set from Luke Harangody, Pau Ribas and Romain Sato. Luke Sikma, son of NBA legend Jack Sikma, signed a custom card as well. 30 December 2014 - Three weeks ago Sasha Vujacic visited Valencia Basket with the Baskonia Laboral Kutxa team. I had made preparations for a custom jersey card for him, but at the time the original jersey card hadn't arrived yet, so he could only sign the design sticker. Yesterday I finally got my package with jersey cards and I finalized the card today. Another awesome custom jersey auto card for the collection! 30 December 2014 - Fiatc Joventut came to Valencia today for the last game of 2014. The team from Badalona has been doing pretty well, and our team not so, with another loss only a few days ago. Therefore a win today was imperative and fortunately we got one. Up to halftime it was a close game but we took the win with 83-66. I couldn't attend, but prior to the game I caught up with a few players. Sitapha Savané signed a regular card and Clevin Hannah signed a custom card. 22 December 2014 - Herbalife Gran Canaria visited Valencia yesterday. They're known as tough competitors and they sure lived up to their reputation. It was a close game throughout with our team ahead most of the time, but without ever really sealing it. It was only in the second half, when Harangody and Sato started making their mark, that we became significantly stronger and in the end won 101-92; our second win in three days scoring over 100 points. 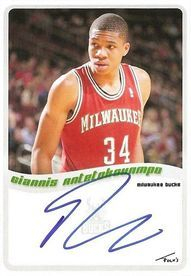 After the game I was very happy to pick up a signature of last year's draftee and huge NBA prospect Walter Tavares, as well as further auto's on custom cards from DaJuan Summers, Kyle Kuric, Levon Kendall and legendary Spanish coach Aíto García Reneses (coaching 40+ years, 1000+ games and 700+ wins). 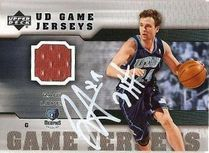 Brad Newley signed a regular card and Sam van Rossom signed a Valencia Basket custom card. 19 December 2014 - Valencia Basket played their last Euroleague game yesterday against Lithuanian team Neptunas Klaipeda. As the team had lost all its possibilities of qualifying for the Last16 there was nothing at stake, except for the coach who needed a good result to curve some of the criticism he's been getting lately. We pulled off our biggest win of the season: 103-65. 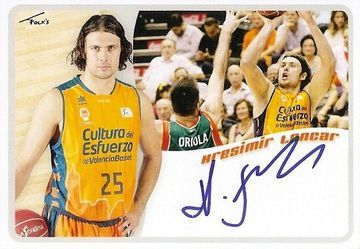 After the game Mustafa Shakur and Keith Benson signed custom cards, Luke Harangody signed a regular jersey card and Guillem Vives, Vladimir Lucic and Nemanja Nedovic signed cards for the Valencia Basket set. 07 December 2014 - Today Valencia basket received Laboral Kutxa again. The team from Vitoria played here last month as well in the Euroleague and in fact next week we'll played them on the road for Euroleague as well. This game was important to get into a winning mood again, while the road game will be to survive and have a chance to make it to the Euroleague Last16. In short, a lot at stake and fortunately we won this game fairly easily by 15 points. I couldn't attend the game but was able to go to the arena before the game when the players arrived. 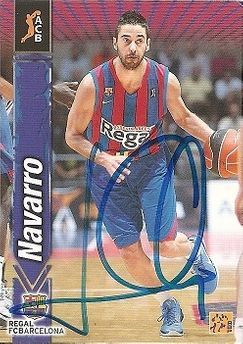 Spanish vet Fernando San Emeterio signed a regular card, locals Rafa Martínez and Bojan Dubljevic signed cards for the Valencia Basket team set and Tornike Shengelia and Sasha Vujacic signed custom cards as well. The latter, for Vujacic, was actually not a card but just the sticker design. I had meant for this to be a custom card with a piece of jersey, but unfortunately I hadn't received the original jersey card yet. Stay tuned for a new video of the making of this jersey auto card! Awesome mailday from Derrick Byars! 02 December 2014 - Two months ago I missed the season opening game against Baloncesto Sevilla because my daughter had a slight fever so I needed to take care of her. Missing the game was a bummer because it was Derrick Byars, Zoran Dragic, Scott Roth, Audie "Atomic Dog" Norris and a lot of other players I wanted to see. I decided to put my cards for Derrick Byars in the mail, explaining I missed the game here. Today I received mail back - I had forgotten all about those cards, thinking they had gotten lost in mail or in the organisation. Turns out he not only signed both cards, but he also wrote a very kind note with it thanking me for the support and asking about my daughter. A top class act from Byars and I appreciate it a lot. For those who wonder why I have this crazy hobby... here's a hint to the answer :). Euroleague win and new Valencia cards! 29 November 2014 - Turkish team Galatasaray visited Valencia Basket yesterday in a crucial game to maintain options of qualifying for the Last16. We needed a win more than ever - and so did the coach, whose continuity was now being questioned openly. Fortunately we pulled off a good win with intense basketball and solid defence. From the Galatasaray team Carlos Arroyo, Nate Jawai and Martynas Pocius signed custom cards. I also brought my newly made 2014-15 Valencia Basket set and Serhiy Lishchuk, Kresimir Loncar and Pablo Aguilar signed their cards. Unfortunately it was raining outside and when Lishchuk signed his signature got a bit messed up - may have to try that one again later this season. Tough loss again, but 300th signed card! 24 November 2014 - Yesterday Unicaja Málaga visited Valencia Basket in the Spanish league. After a narrow loss in Euroleague on Thursday, which almost eliminates the team, Valencia could really use a victory. However Unicaja came out strong and we took another loss by 11 points. After the game Jon Stefansson and Fran Vázquez signed regular cards, Jayson Granger signed the game program and Fran Vázquez, Nemanja Nedovic, Caleb Green, Will Thomas and Mindaugas Kuzminskas signed custom cards. This morning I realized that the card Will Thomas signed was actually my 300th signed card in total! This is from 173 different players. Quite a milestone! 22 November 2014 - Today I am posting two new tutorial videos. The first one is in Spanish and it features Spanish basketball legend Jorge Garbajosa, former player of the Toronto Raptors. The second video is my first double jersey card and features former Bucks, Warriors and Nets player (and fellow Dutchman!) Dan Gadzuric. Enjoy! 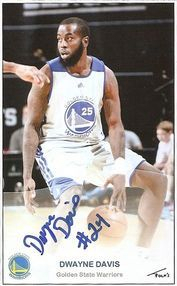 13 November 2014 - I got a nice signed custom card in the mail today from DeShaun Thomas. 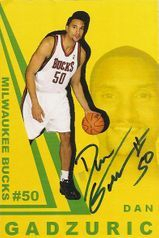 He's a former Ohio State Buckeye who was drafted by the Spurs in 2013, but then went on to play for Nanterre in France. This season he signed with FC Barcelona and he's putting up some solid numbers. You never know with these teams whether you can get close to the players after the game so I decided to send him a card for signature about two weeks ago. Today I already got it back! 09 November 2014 - Only two days after our Euroleague win vs Laboral Kutxa we received Obradoiro for the ACB (national) league. They came out strong, taking advantage of our defensive mistakes. However we managed to take the lead before half time and ended up winning the game with 17-point margin. After the game former Wizards Summer League player Daniel Miller signed a custom card for me. 07 November 2014 - Valencia Basket received Spanish team Laboral Kutxa Baskonia yesterday in Euroleague. It was a game we desperately needed winning because we went 0-3 so far. The team rose to the occasion and pulled out a solid win. Luke Harangody had 23 points, and Sam van Rossom had 14 points and 9 assists to compensate the absence of Dwight Buycks who was cut from the roster just before the game and is expected to sign with an NBA team soon. Aftr the game I received autographs on custom cards from Sasha Vujacic, Tonike Shengelia, Lamont Hamilton, Doron Perkins and Colton Iverson. Sasha Vujacic also signed a regular card. 27 October 2014 - Yesterday Valencia played Tuenti Estudiantes at home. It was a good win that helped us get back in the top ranks of the competition. Unfortunately I couldn't attend but as always my friends had my back. They had James Nunnally and Diamon Simpson sign my custom cards. Great additions to this year's collection that already counts 30 custom cards! 18 October 2014 - Got mail in yesterday night from a TTM attempt I sent out a couple of weeks ago. 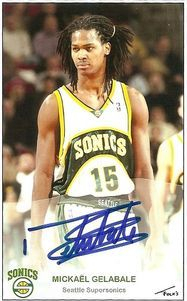 It's from former Wolves, Celtics and Clippers Ryan Gomes who now plays with Laboral Kutxa in Spain. When I realized he was only signed for the first round of Euroleague I decided to send him cards, especially because the team has already signed his successor in DJ White. Here are the awesome custom card and regular card that came back signed yesterday! 17 October 2014 - Yesterday Valencia Basket received Greek powerhouse Olympiacos at home for our first game of the Euroleague season. It was the homecoming of Oliver Lafayette who this summer moved from Valencia to Piraeus, Athens. It was a tough game and through some bad plays and arguable refereeing we ended up with a narrow loss. After the game I received autographs on custom cards from Olympiacos' Othello Hunter, Brent Petway, Bryant Dunston, Oliver Lafayette and their foremost player Vassilis Spanoulis. Two new custom jersey cards! 27 September 2014 - Yesterday and the day before I made two new custom jersey cards, one of Dirk Nowitzki and one of Shaquille O'Neal. I recorded the assembly of both cards and edited it into 5 minute tutorial videos, so you can see how I put them together. Enjoy! 19 September 2014 - Yesterday Valencia Basket played a preseason game in a nearby town against Russian powerhouse Nizhny Novgorod. Unfortunately four of the team were injured or rested so we had a pretty reduced lineup which resulted in a defeat by the Russians. Nevertheless it was a great opportunity to see the team play with the newly acquired players. After the game I received autographs on custom cards by Romain Sato, Dwight Buycks, Trey Thompkins, Tarence Kinsey and Taylor Rochestie. My first custom jersey card... signed! 10 September 2014 - I am very pleased to show this card I recently made of José Calderón. It is the first time I have attempted to make a jersey card, by using a swatch from an existing, licensed card (2010-11 Panini Limited Threads) and it actually worked pretty well. What's even better is that along with the cards that my friends had signed last week at the World Cup, they also brought this card and they were fortunate enough to have Calderón sign this one as well! It is an absolutely amazing card! I meant to post this earlier and along with a tutorial video of the assembly of this card. However I think that is going to have to wait until I do a new custom jersey card. 03 September 2014 - Good friends of mine went to several World Cup games a couple of days ago and they were extremely kind to take some of my cards with them for signature. Of course I hoped for some good autographs but I never thought they would achieve as many as they did. I got autographs on regular cards from Anderson Varejao and Nenê from the Brazilian team and Nenad Krstic from the Serbian team. Then from the Spanish team Pau Gasol, Marc Gasol, Ricky Rubio, José Calderon, Rudy Fernandez, Sergio Rodriguez and Sergio Llull signed custom cards and so did Pablo Prigioni, Luis Scola and Andrés Nocioni from Argentina. Needless to say I am absolutely amped about these great additions to my collection, absolutely an amazing gesture from my friends! 28 August 2014 - Had to go to Madrid today and brought along my cards for the Real Madrid and Spanish National Team in case I'd see any players there. At the last minute I also took my Nando De Colo card with me, as he has relatives here and I knew he was in town. To my surprise I actually DID run into him at the Valencia train station and he went on the same train as me as he was heading for his new team CSKA Moscow. We had a quick chat and he signed my custom card! What are the odds?! Awesome! Kicking off the 2014-15 Folk's Cards set! 26 August 2014 - Today former Celtics and Cavaliers PF/C Luke Harangody was presented as a new player for Valencia Basket. I attended the presentation and afterwards had an opportunity to catch up with him and get two custom cards signed of the new 2014-15 Folk's Cards set. I am very excited about this new set, which I now made completely in Photoshop, and the result is amazing: very clean designs and the quality is excellent. In a few days' time I will be able to show you a few more very exciting cards that a friend of mine was able to get signed for me. In the meanwhile, upon request of a few visitors, Beckett board members and YouTubers I have made a quick behind-the-scenes video on how I designed this set. Hope you enjoy it! 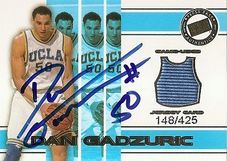 07 July 2014 - I am very excited to have received a package today from former UCLA and Milwaukee Bucks player and fellow Dutchman Dan Gadzuric. It was a through-the-mail venture that I sent out mid-January, then appeared to have gone lost in mail, resurfaced a month ago and now finally, almost half a year later, arrived back with me. Needless to say I was very relieved getting this back to me, especially because it contained the UCLA custom booklet that had already been signed by Swen Nater previously. Besides that booklet, there were also two other custom cards, a regular card, one with a swatch and one with a four-color patch. As you can see in the below video and scans, the cards look great and I am very, very happy to add these beauties to my collection! 21 June 2014 - About two years ago I did a five-card set of custom booklets for Valencia Basket. Then, it included Rafa Martínez, Nando de Colo, Victor Claver, Serhiy Lishchuk and Nik Caner-Medley. This time around, an improved version of the first series' design and five new players: Oliver Lafayette, Bojan Dubljevic, Sam van Rossom, Justin Doellman and Romain Sato. I will post scans soon, for the time being here's the presentation video. It's ujst over seven minutes long, but about ten seconds into the video you'll also see a link to a 'blitz presentation' video that has a duration of about a minute and a half. That video is also available in Spanish. Further below, the images. Enjoy! 15 June 2014 - Just came home from an amazing win-or-go-home Game 5. After the two losses at home against Barcelona, we won both games in their arena to equal the series for a decisive final game. We led by 11 at halftime, but with -once again- some questionable calls we were trailing throughout most of the second half. However we tied the game 75-75 with 6 seconds on the clock, which unfortunately was enough for Marcelinho Huertas to make a buzzer-beating layup. Nevertheless it's been an amazing season, winning the Eurocup trophy, setting a historic team record for victories and with a ticket for the Euroleague tournament next season. After the game I received two autos on regular cards from Pablo Aguilar and Brad Oleson. 10 June 2014 - The day before yesterday our team suffered its second home loss in playoffs against Barcelona (59-60). We were up by one with only two seconds left on the clock, when we failed to grab a defensive rebound which Ante Tomic converted into an easy bucket underneath. 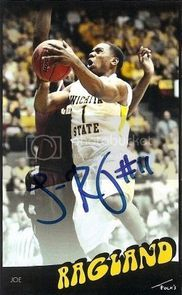 I couldn't attend the game but a friend of mine, who I lend my pass, managed to get three cards signed for me - another custom card of Jacob Pullen in Kansas State uniform and also two regular cards of Joey Dorsey and Juan Carlos Navarro. The playoffs now head to Barcelona where it will be a win-or-go-home situation for us. 06 June 2014 - Yesterday we received FC Barcelona in the first game of the Semifinals in ACB Playoffs. We played a dreadful game with terribly low shooting percentages and a clear disadvantage in rebounding. Once again the refs made some arguable calls, but for Game 2 tomorrow we will have to focus on improving our own game first. In the morning I caught the team when they arrived for a shooting session. Juan Carlos Navarro, Maciej Lampe, Ante Tomic and Bostjan Nachbar signed custom cards for me. After the game yesterday evening I received further autographs on custom cards from Joey Dorsey, Alex Abrines, Marko Todorovic and Jacob Pullen. Maciej Lampe signed a regular card and so did former Valencia player Matt Nielsen. I won't be able to attend tomorrow's game and the following two games are in Barcelona, meaning this one might have been my last game of the season. 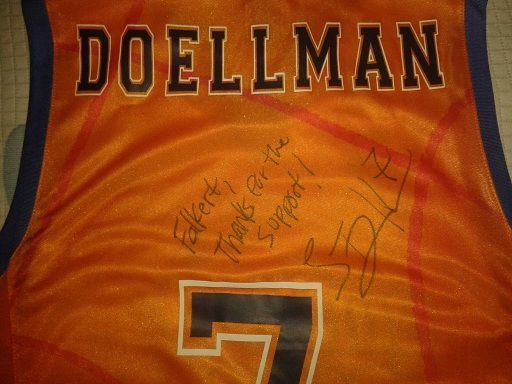 Justin Doellman is more than likely to leave the team (to Barcelona it's being said) so I asked him to sign my jersey! 30 May 2014 - Yesterday Cajasol Seville visited Valencia again, this time for the first game in the Playoffs Quarter Finals. Just like the previous game two weeks ago it was another messy game and also the refereeing was questionable to say the least. By halftime we lead by eight points, an advantage we were able to extend over the second half to finally win the game 84-54. Tomorrow is the second game in this best-of-three series. If we win we will face either Barcelona or Laboral Kutxa. But first let's get that W tomorrow, otherwise it'll be a decisive game here in Valencia on Tuesday. After yesterday's game I had the opportunity to get two custom cards signed by Marcus Landry (brother of Carl Landry), which I couldn't get signed two weeks ago. I also made another card for Kristaps Porzingis - just in case he gets drafted this summer. 12 May 2014 - Yesterday Cajasol visited Valencia Basket. It was the first home game following the Eurocup championship victory so there were a lot of celebrations going on preceding the game. It was a pretty messy game with Cajasol playing very well. It culminated in a last minute that had some incredible clutch shots, a one-handed facial on Dubljevic by Marcus Landry, a three pointer by Lucic to break the tie at 2,6 seconds and an amazing buzzer-beating three by Scott Bamforth to bring it to overtime. In overtime we came out way stonger and we took the game 104-93. After the game I got autographs on custom cards from Tomas Satoransky and Kristaps Porzingis, and Romain Sato and Aito García Reneses, who coached his 1000th ACB game, signed regular cards. I also had an opportunity to get my picture taken with Eurocup trophy, which was fun. 08 May 2014 - Yesterday Valencia Basket played the return game of the Eurocup Finals. We won the home game by 13 points, leaving all options open, but they controlled yesterday's game throughout in a relatively easy win. It's the second Eurocup Championship trophy for the team and it will grant access to the upcoming season of the Euroleague. For the occasion I did a remake of my 2013-14 Valencia Basket set video which I made a few months ago. 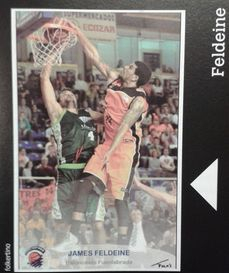 Here is the 2013-14 Folk's Cards Valencia Basket Eurocup tribute video! Wins in national league and Eurocup Final! 03 May 2014 - Today Bilbao Basket played against Valencia and we took a relatively easy W. Unfortunately I couldn't attend the game but a fellow fan was kind enough to have some of my cards signed. Both Raül Lopez and Damir Markota signed a custom card and a regular card. Then the day before yesterday we played the home game in the Eurocup Finals against UNICS Kazán from Russia. We knew it was going to be a tough game because we had faced them twice earlier in the tournament and lost both times. This time however we won by 13 points. It was a victory with mixed feelings because in the third quarter we actually led by over 30 points, which would have virtually sealed the Finals and make the return game coming Thursday a formality. No such luck however and it's going to be fingers crossed and hard work to maintain this lead and bring in the Eurocup trophy. After the game I couldn't stay long so I missed on Andrew Goudelock, but I did catch Luke Harangody for another custom card auto. 22 April 2014 - Today I received another package with through-the-mail autos. This time it was from Victor Claver who plays with the Blazers and is from our Spanish town Valencia. His current second year in the NBA has been equally as difficult as his rookie year and he has been struggling for minutes, although I hope he'll see some action in the Playoffs. 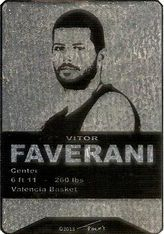 The same day that I sent my cards to Vitor Faverani (see below) I also sent a package to Claver, containing one die-cut card from the Folk's Cards set and a card for the Valencia Basket custom set. Today they finally came back and they're wonderful additions to my collection. 14 April 2014 - The Fuenlabrada team visited Valencia Basket yesterday. After our team's advancing to the Eurocup Finals a few days ago, playing against this much lower-ranked team was a bit of an anticlimax. They pulled off on a good start though and were ahead by as much as 11 points during the second quarter. Valencia got their act together though and in the end took a comfortable win without too much of an effort. After the game our coach Velimir Perasovic signed my Valencia Basket custom card - the last one I needed from the current roster. James Feldeine and Eloy Vargas signed custom cards as well. Now you may remember my update from 25 October last year, when the card I had designed for James Feldeine was printed in the Fuenlabrada team magazine. I had taken the magazine with me and got a few autographs in there as well. Andy Panko and former national team player Carlos Cabezas signed their picture on the cover. In the interior pages I got further autographs from Marcus Arnold and Moussa Diagné, who was actually carried off the court after he had fainted in the second quarter. James Feldeine signed the picture of my card also. 02 April 2014 - Yesterday Valencia Basket received Russian team Nizhny Novgorod in the home game of the Eurocup semi-finals. Although theoretically our team is stronger, Nizhny Novgorod proved to be a tough competitor and we won the game by only 9 points. Therefore we must win next week's return game or at worst lose by a maximum of 8 points to proceed to the Finals, which is feasible but won't be easy. After the game I received autographs on custom cards from Dijon Thompson, Primoz Brezec and Taylor Rochestie. 28 March 2014 - I just received the first of a few through-the-mail ventures I have got out there. Today's is of Vitor Faverani, the former Valencia Basket big man who, after doing some workouts with various NBA teams, signed with the Celtics last summer. He was not doing too bad at all in Boston, but unfortunately his season was cut short due to surgery on a torn meniscus. Two weeks ago or so I sent him three custom cards, one of which a die-cut, and he very kindly signed all three. I am absolutely thrilled about these, because he's a great guy and I think he has got great potential to become a dominant center in the NBA. Awesome! 28 March 2014 - Tomorrow Valencia Basket will receive the Obradoiro team from Santiago de Compostela. What's a bummer is that Nick Minnerath (several NBA workouts) moved to a French team in January and Mike Muscala (Atlanta draft pick) was called up by the Hawks just a month ago and left too. As I wont be able to attend the game I caught the team upon their arrival today and got autographs on custom cards from Durand Scott and newly signed Travis Peterson. A few days ago I also received the through-the-mail autos I had sent to two American players in Holland, Patrick Richard on a custom card in Iowa Energy uniform and one of Justin Knox from his days as a North Carolina Tar Heel. 24 March 2014 - In anticipation of the possible imminent departure of Lubos Barton from Valencia Basket - he was signed to cover for injured players who are now rejoining in the team - I quickly picked up two more autos from him today. 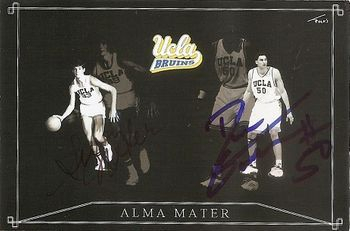 One was on a custom card from his days at Valparaiso. The other on his warm-up jersey that I won in a contest a few months ago. 22 March 2014 - A little while ago I was able to organize a little surprise for a befriended collector who has a special interest in Ryan Toolson and Jaycee Carroll. In short, I made custom cards of these players and had them signed and dedicated to him, Toolson's through-the-mail and Carroll's in-person. A few days ago the cards arrived with him, so with the surprise revealed I can now show my copies as well, listed on the custom cards page. 17 March 2014 - Yesterday Valencia Basket received Unicaja. A tough opponent as always and also very advanced in Euroleague, the team from Málaga was bound to give us a hard time at home. Nevertheless we lead pretty much throughout the game and ended up taking the W by 91-83. Unfortunately I couldn't attend the game but a fellow fan was extremely kind and picked up my cards to get them signed. I received autos on custom cards from Fran Vázquez, Earl Calloway, Zoran Dragic and Latavious Williams, for the Valencia set from Romain Sato, Bojan Dubljevic and Rafa Martinez and two more from Thomas Kelati. It's awesome when people help you out for the love of the hobby! 05 March 2014 - Today BC Khimki visited Valencia Basket in the first last-16 game of the Eurocup. As mentioned before the anticipation was high because the Russian team has been tipped as a potential candidate for the trophy and arrived here with a 31-game winning streak. From tip-off on, though, Valencia Basket was ahead, finishing the first quarter 27-12. Although the lead went up and down throughout the game we finally took the win 75-59. A 16-point lead that in theory should give a bit of breathing space and flexibility for the return game in Moscow next week. At the last minute it turned out that I couldn't attend the game, but fortunately I had already intercepted the team yesterday upon their arrival in the airport. I received autos on custom cards from Mickaël Gelabale (2), Sergei Monia and James Augustine. 03 March 2014 - Yesterday we played against Laboral Kutxa - formerly know as Baskonia. The game was of particular interest because it was the Spanish league debut for Lamar Odom, who signed with the Vitoria team just over a week ago. Despite the high expectations his physical deficiency was evident and he ended up with 2 pts (1/5 FG%), 2 reb, 1 blk and 1 ast in almost 17 minutes. The game itself was not of a high standard either but we managed to maintain our lead through the second half to win it 67-55. After the game a big crowd waited outside to catch a glimpse of Odom and it was of little surprise that he was escorted by team assistants straight into the bus. I did get a chance pick up autos of Andrés Nocioni and of former Spain Olympic Team coach Sergio Scariolo on custom cards. 19 February 2014 - Following last week's victory in Oostende, Belgium, Valencia Basket had already qualified for the Eurocup Last 16. Yesterday's game against UNICS Kazan still was an important one for seeding purposes, as winning by 7 points would make us leader in our current group, thus avoiding the very strong BC Khimki in the next round. After trailing by almost 20 points in the first quarter we made a slow but steady comeback and Valencia was even up by 4 points in the last quarter. We couldn't extend that lead however and we ended up losing the game 73 -76. After the game I received autos on both custom and regular cards from Andrew Goudelock and Luke Harangody and newly signed Valencia center Ksystof Lavrinovic signed his card from the Valencia Basket set. Finally Belgian basketball legend Tomas van den Spiegel, who visited our Belgian guard Sam van Rossom, signed a regular card as well. 03 February 2014 - Yesterday Valencia Basket received FC Barcelona in what was a crucial game for consolidating our second position in the league's ranking. To add to the difficulty of this face off, besides the existing three injured players Justin Doellman was a last-minute in-active due to a minor injury. Barcelona started off very strong and was ahead 16 points in the second quarter. In the third quarter, however, Valencia made an epic comeback with a 33-16 split. The fourth quarter was an equal battle and the game could have gone either way. The 'Fonteta' arena turned into hell's kitchen with the fans supporting the team more than ever, which may have given that little extra to help Valencia take the win 95-93. After the game I was able to pick up autographs from Mario Hezonja, Joey Dorsey and Juan Carlos Navarro. 25 January 2014 - Today FIATC Joventut Badalona visited Valencia Basket. Despite raking only tenth (we are second), they lead pretty much throughout the entire game up until the fourth quarter when Valencia pulled an amazing 33-11 to win the game 85-69. I couldn't attend the game, but fortunately I had the opportunity of seeing the players arrive before the game. Devoe Joseph signed a custom card. So did John Shurna and he signed a regular card as well - his Prizm rookie. 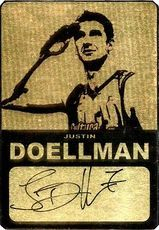 Justin Doellman signed his custom card for the Valencia set. 24 January 2014 - I have added a new page called 'Featured' on which I will occasionally highlight a card with a more elaborated story. I have done posts like this in the past already, but those I placed directly on the pages of the corresponding collection, which made it a bit messy. With those existing posts now migrated to the Features page, I have also taken the opportunity to clean up the Regular Cards and Custom Cards pages. All existing cards in those collections have been placed in reverse chronological order and any future cards added to these pages will now be placed on top so that it will be easier to see the new additions. 22 January 2014 - Following last week's loss in Russia, Valencia Basket played their third game in the Eurocup Last32 yesterday, receiving the Polish team Stelmet Zielona Gora at home. It meant the return to 'La Fonteta' of Adam Hrycaniuk who played part of last season with Valencia and who is now part of the Polish team. Valencia dominated the game throughout and won the game 90-53. After the game I received an autograph of Christian Eyenga (former Cavaliers, Lakers and Magic) on a custom card and two autographs of Craig Brackins (former Sixers) on regular cards. 12 January 2014 - Yesterday Valencia Basket beat the visiting Iberostar Tenerife 92-67. This victory marked a 13-2 record - an achievement the team has made never before. Besides this, the win also meant Valencia will be group leader in the King's Cup, to be held the first week of February in Málaga. After the game I picked up autographs on custom cards from Luke Sikma (son of NBA legend Jack Sikma) and Juanma Iturriaga, Spanish legend and current color commentator for Spanish TV (he is depicted on Wikipedia as an example of color commentator!). For the Valencia Basket set I received autographs from Lubos Barton, Serhiy Lishchuk and Pau Ribas. 09 January 2014 - Yesterday BC Oostende visited Valencia Basket in the first game of the Last32 round in the Eurocup. Considering 'basket average' will be a factor in determining classifiers, opponents and home court advantage winning this game was very important, preferably with a good lead. Although we didn't play very well we won the game by 27 points. After the game I received autographs on custom cards from Ryan Thompson and Gregory Echenique. Won a personalized warm-up jersey! With my message I won Lubos Barton's warm-up jersey and I got to pick it up yesterday. What a great way to close off 2013! 27 December 2013 - Today Estudiantes Madrid played at Valencia and we beat them fairly easily. Their most notable player Lucas 'Bebe' Nogueira didn't play as he is currently in the US sorting out an injury. I did get a moment to catch up with Kyle Kuric and get his signature on a custom card that captures a very exciting moment. Check out the video for the full play! 23 December 2013 - Yesterday the unbeaten (10-0) Real Madrid visited runner-up Valencia Basket (9-1) in quite possibly the game of the season. Valencia led throughout the game with up to so much as 15 points of a lead. However poor (rigged?) officiating and Rudy Fernandez's flopping turned the game around and Madrid eventually took the game by 7 points. The day before yesterday when the team arrived in Valencia a was able to get autographs from Sergio Llull and Felipe Reyes. Yesterday after the game I received further autos from Sergio Rodríguez, Marcus Slaughter, Tremmell Darden, Dontaye Draper and Nikola Mirotic. 17 December 2013 - Valencia Basket received ASVEL Villeurbanne from Lyon, France in a decisive game to determine which of the two teams would go on to the Eurocup Last 32. Despite the away loss a few weeks back, Valencia dominated throughout the game with a comfortable 30+ lead and finally won 97-70. After the game I was able to pick up autographs from our local players Sam van Rossom and Oliver Lafayette for the Valencia Basket set. I got further autographs on custom cards from Travis Leslie and Chris Wright. 15 December 2013 - Yesterday Valencia received the regional UCAM Murcia team. It was the 'homecoming' game of Rodrigo San Miguel who played two seasons in Valencia but moved on to Murcia this summer. Although our team had a comfortable lead at some stage of 22 points, it became a close game towards the end. Scott Wood even nailed a threepointer with 12 seconds left on the clock to bring the Murcia team back to only 1 point difference. We did manage to maintain the lead though and won by two points. After the game I picked up autographs on custom cards from Dwayne Davis, Scott Wood and Ehimen Orukpe. 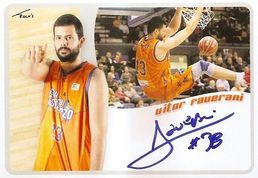 For the 2013-14 Valencia Basket set I received autographs from Vladimir Lucic, Pablo Aguilar and Juanjo Triguero and Rafa Martínez signed a retro card. 12 December 2013 - Following the earlier release of preview pictures of the new Valencia Basket cards I decided to go a step further and also make a little promo video showcasing the main cards of the set. Released via Facebook, Twitter and this website, let's try and make this viral! 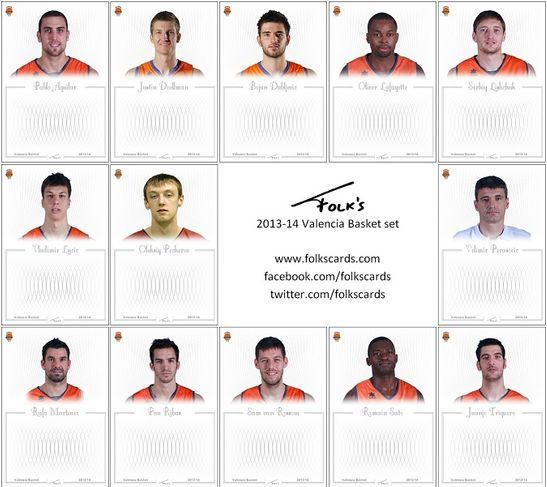 New Folk's Cards Valencia Basket set!! 4 December 2013 - It has taken me a little while but finally the 2013-14 Valencia Basket set is ready. This time I decided to use portrait photos, which for this design work really well. It also left a lot of space at the bottom for a dedicated and easily identifiable area for the signature. I hope you like them too! 20 November 2013 - Yesterday's was expected to be a tough game - in fact, the coach had called for all ticket holders to come and support the team as much as possible. It turned out that things went much more smoothly than expected as we beat the French team 98-52, doubling their score almost throughout the entire game. After the game I picked up autographs from Romain Sato, Oleksiy Pecherov, Jawad Williams, Daniel Ewing and Elton Brown. Brown was very excited to see the custom card that I had made depicting him in the uniform of the now defunct Colorado 14ers. 11 November 2013 - We received the CAI Zaragoza team yesterday in Valencia. It was a tight game up to halftime but then Justin Doellman started heating up and we finally won with over 20 points difference. After the game I had the opportunity to have a chat with my fellow countryman Henk Norel and I also picked up these autos from Joseph Jones and Michael Roll. 07 November 2013 - Yesterday we played Eurocup basketball, receiving Italian team Pallacanestro Varese at home. After trailing during the first few minutes the Valencia team picked up the pace and then lead throughout. We won the game 98-64. After the game I picked up autos from Frank Hassell (Atlanta Hawks Summer Camp) and Aubrey Coleman (former Austin Toros). 02 November 2013 - Tonight Valencia Basket set a milestone victory by winning 108-57 against Valladolid. It was the franchise's highest-ever scoring difference in the Spanish ACB League. I received an autograph from former Kansas State player Akeem Wright, who currently plays with Valladolid. I had also hoped to catch former Grizzlies and Raptors player Will Solomon too who was rumored to be close to signing with the team, but it appears that that finally didn't go through. 25 October 2013 - Via Twitter the Fuenlabrada basketball team recently called for people to send photos of their players. I decided to send through the card I had made of James Feldeine and I promptly received a message that it would be included in the next edition of the team's magazine Fuenlaoé. Yesterday I got a copy of it in the mail and was extremely proud to see my card published. Thank you Fuenlabrada! 06 October 2013 - After a long, long wait finally the new season has kicked off and today was the team presentation game - the last of the preseason games. Valencia Basket received the Cajasol team from Seville who we beat quite easily. I was able to get 6 custom cards signed inclduing Oliver Lafayette (Celtics), Tomas Satoransky (Wizards), Latavious Williams (Tulsa 66ers), Scott Bamforth (Weber State) and a retro card of Bojan Dubljevic. Particularly interesting was meeting Johnny Rogers who played with the Cavaliers and Kings in the mid-80s before playing in Europe. He has been living in a nearby town for a long time now where he coaches a local team. 28 August 2013 - This week is marked by most Spanish League teams kicking off their preseason preparations and I thought it would be a good moment to give a sneakpeak of the custom card set I have prepared so far. Below are the 50 cards I prepared for (mostly) ACB players, while I am still awaiting the latest domestic transactions as well as next month's draw for players from Eurocup teams that will play against Valencia Basket. The set is made up of 17 NBA cards, 17 NCAA cards, 8 ACB cards and 3 of other leagues while five further cards feature current NBA players. The cards maintain the most recent design of last year's custom cards. More to come soon, so stay tuned! 20 June 2013 - Yesterday I went to get my next season's pass for Valencia Basket and I coincided with Florent Pietrus holding a press conference following the team's announcement earlier in the morning of his contract not being extended. One of the team's most emblemetic players, he was the first winner of the franchise's 'Trofeo del Esfuerzo', an audience vote-based acknowledgement rewarding a player's unselfishness and hard work throughout the season. Besides being a great player, most of whose efforts don't appear in the box score, he is also a tremendously friendly person and was very much loved by the people. We had a short chat and he signed a retro insert I had prepared for the new Valencia Custom set 2013-14. All the best Flo! A quick update to let you know that from now on you can get here through www.folkscards.com . You don't need to update your bookmarks as it simply redirects to the longer address. 29 May 2013 - Yesterday the Valencia team lost Game 3 in a best-of-three quarter finals. We had won the first game at home with a devastating 80-42, lost the road game 122-120 in 3OT and yesterday it simply didn't happen. Time therefore to take stock of what has been the 'result' in in-person autos. I received a total of 21 autos on regular cards, one signed ticket and 58 autos on custom cards - 24 of which for the Valencia custom set. This makes a grand total of 70 signatures, not including a few autographs on the warm-up jersey or what I received through the mail. Although I am of course happy with the quantity, what I really take pride in is the positive feedback I received from players on seeing the custom cards that I did. Particularly those cards depicting the player in their college days got a good response. In the off-season it will most likely be a bit more quiet here but I hope to be back soon with new updates. 4 May 2013 - Today marked the 25th anniversary of Valencia Basket ascending to the first division league, which was celebrated with our team wearing jerseys with the same design as back then and by honouring the players of that legendary team. We won our game against Valladolid and after the game I picked up a few autographs for the Valencia Custom set, as well as on a custom card for Ryan Humphrey and a 2004-05 Xavier game schedule that features Justin Doellman. Also attending the game was local hero Victor Claver, who currently plays with the Portland Trail Blazers. He came back to town a few days ago for the summer after not qualifying for the NBA Playoffs. We chatted a little while about how things had gone for him in the NBA this season and he kindly signed two custom cards as well. Lastly a fellow fan had gone to see our former player Nik Caner-Medley, who currently plays with Maccabi Tel Aviv in Israel. As a favor she very kindly had two of my cards signed. 30 April 2013 - By a local basketball fan I was requested to make a team set of custom cards for Israeli team Maccabi Tel Aviv. It proved to be quite a challenging project, firstly because of the size of set - 14 cards in the set plus a few others not included in the Maccabi set - but also because of the lack of decent photo material. In the end however the set came out very well and I may even use the design as a template for future projects. Read more on the newly created 'Contracted work'-page. 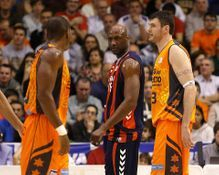 21 April 2013 - Valencia Basket played against Lagun Aro, the team from San Sebastian that is going through a pretty rough patch as they currently rank penultimate. In first half our team was better but we didn't quite make a gap, it was only in the second half that the team sharpened up and eventually took the W by 28 points. Before the game there was a signing session by team legends Victor Luengo and Nacho Rodilla in commemoration of the 10th Anniversary of the team winning the European ULEB cup. They both signed custom cards for the Valencia set. After the game I received autos on custom cards from Ekene Ibekwe, Raulzinho Neto and Adam Hrycaniuk and Lagun Aro coach Sito Alonso signed a regular card. 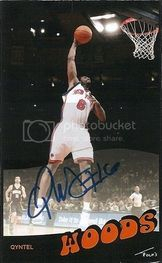 Most notably I also met Qyntel Woods - former Knicks, Trailblazers - whom I had made three different custom cards for. I had found three great photos and couldn't decide which photo to pick for a card. In the end I decided to just make all three and Woods was tremendously kind and signed all three. 8 April 2013 - Yesterday Valencia Basket received Real Madrid; the current leader who have gone 25-2 so far. However, despite having our main centers on the injury list and our team's leading scorer looking at three fouls halfway first quarter, Valencia pinned down Madrid with a solid defense backed up with 12/25 in three pointers. We had a lead of up to 20 points in third but ended up winning it 88-79. 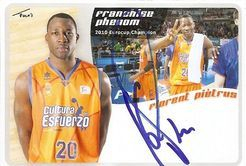 Before the game injured PF Florent Piétrus (brother of Michael) signed a custom card for the Valencia set in a signing-and-picture session. After the game I managed to get a few more autographs, including from Rudy Fernandez and the American players with Madrid. Especially Marcus Slaughter, who is the most cheerful guy you can imagine, was really excited seeing the card I made depicting him in San Diego State uniform. 23 March 2013 - Today Valencia Basket received Herbalife Gran Canaria at home - a direct confrontation as we were tied in classification. We started off quite bad but managed to turn around the game by the end of the first quarter and maintained the lead from there onwards. It was a 'home-coming' game for Brad Newley who played in Valencia half season last year and to the surprise of many wasn't renewed for this season. After the game he signed my Valencia Custom Card. Xavi Rey signed a regular custom card and Jon Scheyer signed a regular Topps McDonald's card. I also had a fun chat with Slovenian player and Raptors pick Uros Slokar, who signed the card shown on the right. He told me that this particular a card was a mess-up by Upper Deck as the player depicted is not him but some Canadian comedian (!!). They sent him a letter of apology and everything, lol. 21 March 2013 - Yesterday Valencia Basket played their home game against Russian team Lokomotiv Kuban in the Eurocup semifinals. We knew it was going to be a tough game but hadn't anticipated on being 19 points behind (3rd quarter). Fortunately we managed to shorten the distance to 10 points and we still have a chance to make it to the finals. After the game I had an opportunity to catch Derrick Brown and Richard Hendrix and have them sign two rookie cards. Through COMC I had also ordered regular cards for Nick Calathes and Jimmy Baron Jr., but unfortunately they didn't arrive in time, so instead I made two custom cards for them, which they signed. 06 March 2013 - Although I had promised myself to stick to only two sets of custom cards for the time being, I had the opportunity of designing and making these cards. 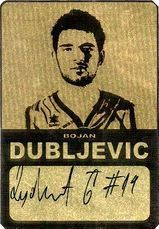 They are gold foil on one side and silver on the back and the card's design is black silhouettes of three players (Dubljevic, Doellman and Faverani) printed on transparent sticker. I slightly cut the corners at a 90º angle to give it a hint of a plain gold ingot. Today, Valencia Basket played against Russian team Unics Kazan in the Quarterfinals of the Eurocup and I had the opportunity of Justin Doellman and Bojan Dubljevic signing their cards. Terrell Lyday, who bombed 6 of 6 three-pointers on us, signed a blank card that I may give a post-signing design. 26 January 2013 - Today Valencia Basket played a home game against UCAM Murcia. Our team miraculously tied the game with 0.7 seconds on the clock, but Murcia amazingly managed to get a tip-in from the following inbound pass and take the victory. Better luck I had getting signatures after the game. Justin Doellman signed my jersey and Thomas Kelati signed my custom Valencia card. I also brought the newly designed custom cards I announced a few days ago for Murcia players Joe Ragland (Wichita State), Marcus Lewis (Oral Roberts) and David Barlow (Australia). It was funny how all three of them were happily surprised to see these cards - especially Ragland who called me back to show his card to an agent he was chatting with and asked where I got the cards from and how I made them. All autos uploaded on their respective pages. 21 January 2013 - I have started preparing a new set of custom cards aimed particularly at obtaining in-person autographs from members of teams playing against my home team that don't have regular cards. The key principle behind this set was to have a one-fits-all template that would allow for a quick turn-around in creating a new card, while still achieving a visually attractive card and an overall consistent set. Although many of these players play for European teams I try to make the cards with NBA or college photos for greater visual value. So far I have made 16 cards, including the below of Marcus Slaughter, Lamont Hamilton, Jakim Donaldson and Alhaji Mohammed. I hope to be able to upload signed versions soon. 6 January 2013 - Valencia played against Bilbao Basket today. We started the game well with a 12 point lead at the end of the first quarter, but ended up giving it away slowly but surely. With 1.4 seconds on the clock they tied the game with a crazy three-pointer to send it into overtime. In OT we managed to take the lead and finally took the game by three points. 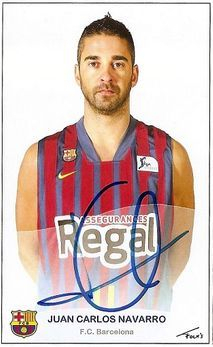 Our injured guard Pau Ribas did a signing session before the game and he signed my custom card. After the game Larry Abia and Mickaël Gelabale signed my custom card from the Valencia Custom set and Raül Lopez signed a regular game-used card. I also had Bojan Dubljevic sign my jersey (for the Jersey project) and Lamont Hamilton signed a blank decoy card. Another great few additions to my collection on a very memorable game night! 19 November 2012 - Today I sold the duplicate Rik Smits autograph custom booklet. While I still hold my own copy, this second copy will go to a buyer in the US. This marks the first time I sell one of my custom cards and I would like to thank the buyer for his interest in my work. Full proceeds of the sale have been donated to the Indiana-based Riley Children's Hospital. The buyer posted a message about this on the Beckett forum, which you can read here. 25 November 2012 - Valencia played against Barcelona today. It was going to be a tough game as we had some injuries and their team is traditionally very strong. We started off 2-14 but ended up winning by three points despite Juan Carlos Navarro having two opportunities to tie it in the last five seconds. The arena was mayhem. Our injured center Vitor Faverani did a signing session before the game. He signed a custom card and my jersey as well. After the game Chris Quinn signed my custom card from the Valencia Custom set and Juan Carlos Navarro, Pete Mickael, Nathan Jawai and Joe Ingles signed regular cards. It was pretty amazing getting seven autos from six players on a single night with a character win to go with it. Follow @folkscards or save #folkscards for regular twitterfeeds. 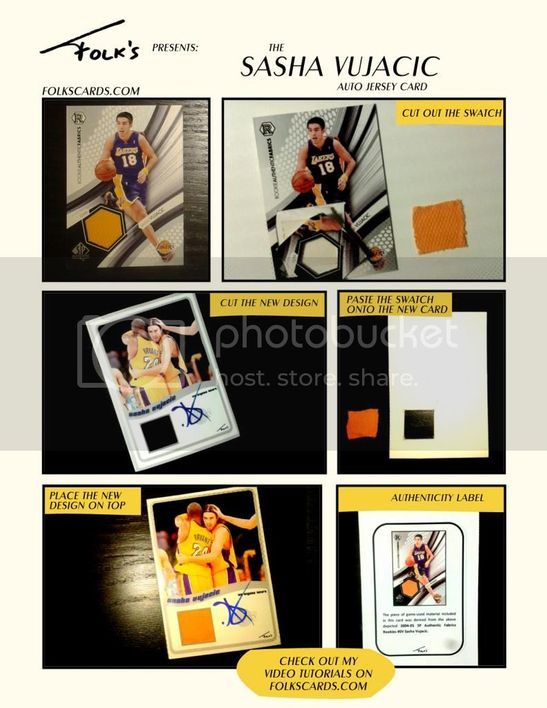 02/07/2015 - added Metta World Peace to signed custom cards and to Regular Signed. 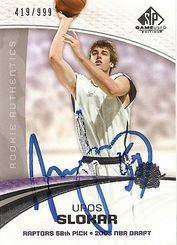 10/06/15 - added Sergio Llull, Rudy Fernandez, Gustavo Ayon, Luka Doncic, Salah Mejri, Marcus Slaughter and Pablo Laso to signed custom cards and Rudy Fernandez, Sergio Rodriguez, Andrés Nocioni, Zan Tabak, Sergio Llull and Felipe Reyes to Regular Signed. 16/05/15 - added Raül López, Marko Todorovic and Latavious Williams to Custom Cards and Alex Mumbrú to Regular Signed. 25/04/15 - added Isaac Fotu and DJ Seeley to Custom Cards and Pedro Martinez to Regular Signed. 14/03/15 - added Jared Jordan and Nemanja Nedovic to Custom Cards and Luke Harangody, Rafa Martínez and Sam Van Rossom to the Gold Rush mini-set in Custom Cards. 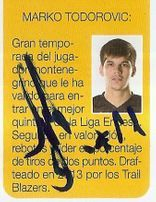 22/03/15 - added Juan Carlos Navarro, Mario Hezonja, Tomas Satoransky, Tibor Pleiss, Marcelinho Huertas, Maciej Lampe, Edwin Jackson, Bostjan Nachbar, Tyler Honeycutt, Tyrese Ryce, Paul Davis, James Augustine and Sergei Monia and Victor Claver to Custom Cards and Victor Claver and Justin Doellman to Valencia Basket set. 05/03/15 - added Bryce Taylor and Svetislav Pesic to Regular Signed. 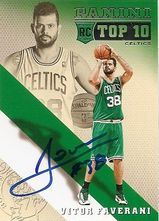 16/02/15 - added Facundo Campazzo, Jaycee Carroll, Felipe Reyes, KC Rivers, Sergio Rodriguez and Zan Tabak to Custom Cards, and Zan Tabak to Regular Signed. I currently have in-person and through-the-mail autos of Larry Abia, Alex Abrines, Pablo Aguilar, Jeleel Akindele, Sito Alonso, Giannis Antetokounmpo, Marcus Arnold, Carlos Arroyo, James Augustine, Gustavo Ayon, Scott Bamforth, Jimmy Baron Jr., Lubos Barton, Sergei Bazarevich, Keith Benson, Muggsy Bogues, Craig Brackins, Primoz Brezec, Derrick Brown, Elton Brown, William Buford, Dwight Buycks, Derrick Byars, Carlos Cabezas, Nick Calathes, José Calderon, Earl Calloway, Facundo Campazzo, Nik Caner-Medley, Jaycee Carroll, Demond 'Tweety' Carter, Victor Claver, Nando De Colo, Tremmell Darden, Paul Davis, Taquan Dean, Malcolm Delaney, Troy DeVries, Moussa Diagné, Justin Doellman, Jakim Donaldson, Luka Doncic, Joey Dorsey, Zoran Dragic, Dontaye Draper, Bojan Dubljevic, Bryant Dunston, Gregory Echenique, Mike Efevberha, Chuck Eidson, Daniel Ewing, Christian Eyenga, Vitor Faverani, James Feldeine, Rudy Fernandez, Isaac Fotu, Dan Gadzuric, Tony Gaffney, Aíto García Reneses, Marc Gasol, Pau Gasol, Sergii Gladyr, Ryan Gomes, Andrew Goudelock, Chris Goulding, Jayson Granger, Caleb Green, Lamont Hamilton, Geert Hammink, Will Hanley, Clevin Hannah, Ben Hansbrough, Luke Harangody, Jarvis Hayes, Richard Hendrix, Mario Hezonja, Tyler Honeycutt, Adam Hrycaniuk, Marcelinho Huertas, Ryan Humphrey, Othello Hunter, Ekene Ibekwe, Joe Ingles, Juanma Iturriaga, Colton Iverson, Cedric Jackson, Edwin Jackson, Phil Jackson, Nathan Jawai, Pooh Jeter, Joseph Jones, Jared Jordan, Devoe Joseph, Thomas Kelati, Marko Keselj, Tarence Kinsey, Justin Knox, Yaroslav Korolev, Nenad Krstic, Toni Kukoc, Kyle Kuric, Mindaugas Kuzminskas, Oliver Lafayette, Maciej Lampe, Marcus Landry, Joffrey Lauvergne, Ksystof Lavrinovic, Travis Leslie, Marcus Lewis, Serhiy Lishchuk, Sergio Llull, Kresimir Loncar, Raül Lopez, Vladimir Lucic, Victor Luengo, Terrell Lyday, Damir Markota, Stefan Markovic, Nacho Martín, Pedro Martinez, Rafa Martinez, Pete Mickeal, Daniel Miller, Nikola Mirotic, Alhaji Mohammed, Chechu Mulero, Bostjan Nachbar, Swen Nater, Juan Carlos Navarro, Nemanja Nedovic, Nenê, Raulzinho Neto, Brad Newley, Andres Nocioni, Lucas Nogueira, Henk Norel, James Nunnally, A.J. Ogilvy, Brad Oleson, Ehimen Orukpe, Haukur Palsson, Andy Panko, Oleksiy Pecherov, Kirk Penney, Velimir Perasovic, Doron Perkins, Svetislav Pesic, Travis Peterson, Brent Petway, Florent Piétrus, Trent Plaisted, Tibor Pleiss, Martynas Pocius, Kristaps Porzingis, Pablo Prigioni, Jacob Pullen, Chris Quinn, Joe Ragland, Anthony Randolph, Felipe Reyes, Ryan Reid, Pau Ribas, Tyrese Rice, Patrick Richard, Jake "the Snake" Roberts, Jason Robinson, Taylor Rochestie, Nacho Rodilla, Sergio Rodriguez, Johnny Rogers, Michael Roll, Ricky Rubio, Fernando San Emeterio, Rodrigo San Miguel, Romain Sato, Tomas Satoransky, Sitapha Savané, Sergio Scariolo, Luis Scola, Durand Scott, DJ Seeley, Mustafa Shakur, Tornike Shengelia, John Shurna, Luke Sikma, Diamon Simpson, Marcus Slaughter, Rik Smits, Vassilis Spanoulis, Tomas van den Spiegel, Jon Stefansson, Bandja Sy, Zan Tabak, Bryce Taylor, DeShaun Thomas, Will Thomas, Trey Thompkins, Dijon Thompson, Ryan Thompson, Marko Todorovic, Ante Tomic, Ryan Toolson, Juanjo Triguero, Ime Udoka, Sam Van Rossom, Anderson Varejao, Eloy Vargas, Fran Vazquez, Guillem Vives, Sasha Vujacic, Jawad Williams, Latavious Williams, Scott Wood, Qyntel Woods, Metta World Peace, Akeem Wright and Chris Wright. Feel free to comment on my website, my cards, sending through-the-mail autos, making custom cards and all that. Please don't ask me for addresses of players that I got autographs from. I don't trade personal data. I found many players by simply searching the internet. If I can do it, so can you. Anything else, I will be all ears.